I saw CATS DON'T DANCE recently at the Mall of America and I absolutely loved it! 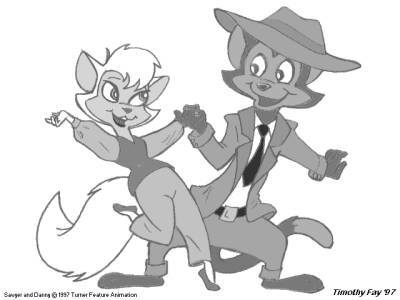 The film, set in an imaginary 1930's era, is about a country cat named Danny who goes to Hollywood to seek his fortune as a song-and-dance feline. But on his arrival in Tinsel Town he's faced with the grim reality of life for animal actors. As fellow performer Wolly the Elephant puts it, "The spotlight will never fall on ones like us" (a thinly-veiled reference to discrimination in the film industry at the time). Undeterred, Danny devises a plan for the animals to make their big debut for movie mogul L. B. Mammoth. 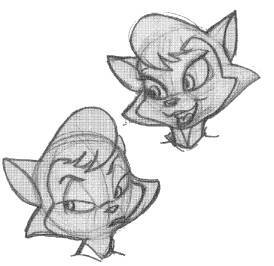 But if there is one reason to like CATS, it is for the film's "bad girl," Darla Dimple, who is one of the funniest and most truly evil cartoon heavies to appear in a long time. She steals every scene she is in and is only partially upstaged by her gigantic gorilla servant, Max ("Yes, Miss Dimple..."). Darla is your worst nightmare come to animated life; sort of a cross between Shirley Temple and Freddy Krueger. Darla is the one obstacle in Danny's path to fame and her over-the-top scheming (counterbalanced by the stone-faced but menacing Max) are easily the high points of the movie. The character designs are a little weird especially on Danny and Sawyer, the female lead (Danny is all torso, Sawyer is all legs), but overall they're quite cute. The animated dance numbers work very well -- a tribute to the artists' ability to capture such complicated movements. And the musical numbers, written by Randy Newman, are worthy of any recent musical. The best is probably Sawyer's torchlight solo, "Tell Me Lies," sung by Natalie Cole. It's a bluesy number performed with feeling rarely seen in animated films (very similar to Judy Garland's rendition of "Paris is a Lonely Town" in GAY PURR-EE). This film is also very much a tribute to the Hollywood as portrayed in films of the 1930's and 1940's -- and you can expect to see a lot of period cameos. It also effectively captures that innocent spirit found in classic musicals of the period. And it's FUNNY! The film relies on a lot of fast-paced, witty dialog and an almost endless array of cartoon sight gags. But neither does the script neglect its main characters: Sawyer is graceful even when doling out sarcastic one-liners and Danny possesses and optimism and irresistible charm that was typical in those old musicals mentioned above. Sadly, this film doesn't seem to be getting the attention it deserves, and may be gone by the time you read this. But if you get the chance then don't miss CATS DON'T DANCE!